Obamacare Day One: A Tale Of Two States : Shots - Health News There was a party atmosphere at Affordable Care Act events both in California, where the law has been embraced by the state government, and in Virginia, where it has been resisted. But consumers will have very different experiences in the two states. 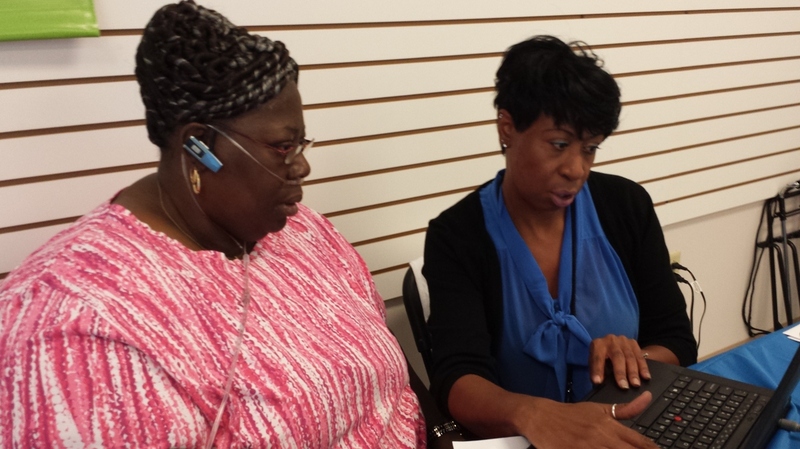 Onita Sanders (right), a certified application counselor at the Southeastern Virginia Health System, helps Virginia resident Brenda Harrell with health coverage options at Enrollfest in Hampton, Va., on Tuesday. In a call center in Rancho Cordova, Calif., on Tuesday, all the workers wore the same T-shirt: "Keep Calm And Go Live." They were ready and waiting to take calls from consumers who could buy health insurance on California's new insurance marketplace for the first time. So the T-shirts urged calm, but the mood was ecstatic and emotional among the architects and key backers who gathered to flip the switch on the Golden State's exchange. Peter Lee, executive director of Covered California, the state's exchange, addressed a cheering crowd in this Sacramento suburb and drew a stark contrast to the grinding politics of Washington, D.C., that shuttered much of the federal government. "While Washington is talking about shutdown, we're talking about startup," said Lee, as he declared an end to the era of a punishing individual insurance market. "Gone are the days of invasive questions when you apply for insurance about your allergies, your asthma, your diabetes, your cancer. Gone," said Lee. "You're never going to be asked that again. Gone are rates based on your answers to those questions." While the mood was equally buoyant at a Hampton, Va., rally, the circumstances for people wanting insurance in the state couldn't have been more different. At Enrollfest, one of the few Affordable Care Act events in Virginia, organizer Gaylene Kanoyton was quick to point out that "the state is not providing any resources. So, we just have to go ahead and move on. It is a grass-roots effort. It is up to all of us as citizens to come together." Kanoyton managed to get a dozen local agencies, health centers and advocacy groups to set up tables at the Boo Williams Sportsplex in the southeastern Virginia city. She advertised the event in churches, community centers and on the radio, and says that some 400 people showed up. Among them was Brenda Harrell, 57, a former hairstylist who's lived in Hampton all her life. "I'm here to get some insurance, some coverage," Harrell said. "I've been out of work over a year, I have heart and respiratory failure, denied for Medicaid, and still don't have any coverage. I haven't seen a doctor for my breathing for over a year." She brought along her portable oxygen tank. She has $19,000 in medical debt already and can't afford new tubes for the tank. She's just been using the same ones over and over, she says. Now she has a glimmer of hope as she sits down with a certified application counselor from a local health center to help her sign up on the federal government's enrollment site, www.healthcare.gov. But the site is overloaded. They try four times, but can't do much more than enter Harrell's name and set up a password. And even if they could, Harrell would still probably be out of luck. Her income is less than $10,000 a year — too much to qualify for Medicaid in a state that's not expanding the program, and too little for a subsidy to help her buy a plan on the exchange. It will be a different story for people in similar situations in California. The state was an eager, early and bipartisan adopter of the Affordable Care Act, said Anthony Wright, executive director of Health Access, a consumer advocacy group. "We were the first state in the nation to set up an exchange, and that was under a Republican governor," Wright said. "Our bill to set up the pre-existing insurance program was co-sponsored by a Republican in our Legislature." While 2.6 million uninsured Californians are expected to qualify for a subsidy to buy private insurance, another 1.4 million will be newly eligible for Medicaid. All told, there are 5 million uninsured Californians who will have to decide what kind of coverage they want to buy to comply with the law's mandate that they have health insurance.